Yerosen’s earliest experiences with Sunday school left her with little understanding of Jesus’ love. 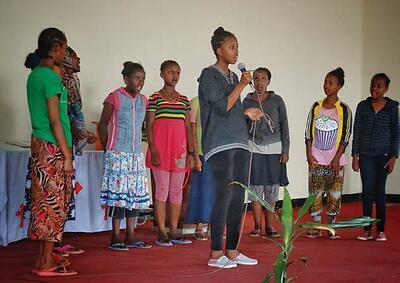 But after her church participated in the Ethiopia Christian Discipleship Project, she learned to love stories from the Bible and found her voice in the church choir. Although Yerosen’s parents faithfully brought her to church each Sunday as a child, she says that she really didn’t learn much about Jesus. “We used to simply go to church, spend some time with friends, and get back home with no knowledge added,” she says. The Sunday school volunteers at Yerosen’s church realized they weren’t teaching effectively, despite their desire to help a new generation grow in their love for God. One of the teachers, Genet, says, “At the beginning, I volunteered at the church to teach small kids, only because I love children.” But she knew that simply reading the Bible to them really didn’t engage the children’s interest. This changed after Genet attended World Vision’s training for Sunday school teachers. As Genet and the other teachers began to use interactive methods such as games, skits, and memory verses, children participated more enthusiastically, which increased their understanding of the Bible. Yerosen noticed the difference in her Sunday school. As teachers caught the attention and imagination of the children, Yerosen says she became more interested in listening to Bible stories. But Yerosen’s real passion is music. She loves the worship songs she learned in Sunday school and decided to join the church choir. Although she was nervous at fi rst, now she says she is “happy and confident to perform any time.” Her dream is to write and record her own songs on an album some day. “I am grateful to World Vision for ... giving me the chance to teach children in a better way,” says Genet.